Fremont, CA – November 17, 2011 – Jason McDonald, a leading SEO / Social Media corporate trainer and speaker in the San Francisco Bay Area, is proud to announce the successful completion of his latest training engagement for associations and non-profits. Dr. McDonald led a one-day intensive SEO / Social Media training session for the National Association of Realtors’ Conference in Anaheim, California. This hands-on course covered the latest topics in marketing and communication for associations and non-profit organizations, focusing on practical Internet marketing. Topics covered included how to use search engine optimization, social media marketing, and how non-profits and businesses should approach Facebook, Twitter, YouTube and LinkedIn marketing. "Social Media such as Facebook and Twitter have shifted the ground underneath the real estate market," explained Dr. McDonald. "So I was very pleased when asked to conduct an intensive one-day workshop / training for professional Realtor® Associations at their national convention in Anaheim. The group exceeded all expections – over fifty eager realtor communications directors actively participated in this one-day in-depth learning workshop on SEO, Twitter, Facebook, LinkedIn and all aspects of Internet marketing. What a great group!" No matter how crucial it may be for the success of your product, marketing seldom receives the full funding that marketing managers think is necessary. Hands-on workshop by Dr. McDonald teach the secrets of marketing without money — think of it as "creating buzz without bucks." For association directors or marketing managers, there are strategies to build awareness, programs to generate trial, and activities to involve early users in the building of your association or non-profit — all with little or no cost. Marketing on Facebook, Twitter, YouTube, Yelp, and other sites can combine the power of free on the Internet with the viral dynamics of Web 2.0 promotion. Email marketing and traditional SEO (search engine optimization) can also be part of the mix. Therefore a complete understanding of variations on the newer freebusiness and marketing models is critical. Using case studies of successful companies, Dr. McDonald’s Internet marketing workshops investigate the use of free marketing opportunities and their best practices so you can develop action plans for your own association or non-profit, with specific examples to the real estate sector. Dr. Jason McDonald is a recognized SEO / Social Media Marketing corporate speaker in search engine optimization, Internet marketing, and search marketing based in the San Francisco Bay Area / Silicon Valley. Dr. McDonald received his Ph.D. from the University of California in 1992, and has worked at many hi-tech start up’s in the San Francisco Bay Area. In addition, Dr. McDonald is Senior Editor at eg3.com, a web portal and email service covering hi-tech embedded systems on the Internet, founded in 1994. Recently, Dr. McDonald has begun teaching marketing, market research and Internet marketing at Bay Area institutions such as AcademyX, DeVry University, and Stanford University’s Continuing Studies. 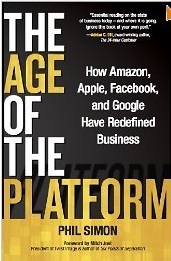 We live in the age of the platform, says Phil Simon. But we also live in the age of the brand, the age of the virtual monopoly, the age of the Internet, the age of e-commerce, the age of social media marketing, the age of Web 2.0, the age of SEO… the age of… Look, up in the sky! It’s a bird! It’s a plane! No, it’s superman! What is a platform, and why should we care? It’s a bird, it’s a plane, it’s super platform! Why definitions and concepts matter. Remember Superman? Remember being a kid, watching on TV, and that famous introduction – "Look, up in the sky! It’s a bird! No, it’s a plane! No, it’s Superman!" What a relief it wasn’t a bird, or a plane. Because if it were just a bird, or just a plane… It wouldn’t have been able to rescue the honorable citizens of Gotham City from the Riddler. No, wait. That was spiderman. Or batman. Which was it? Why do we care? Because it asks important questions. Such as ‘Is Google a monopoly?’ or ‘How do big companies today – like Google, Facebook, Amazon, or Apple both work with and work against their competitors or suppliers?’ It’s not just that they are like monopolies, it’s that they – on the one hand – build up easy-to-use software and great platforms for potential third party applications, but – on the other hand – ruthlessly squeeze suppliers and partners, when push comes to shove. Example: Amazon.com. Its Amazon associates program was one tactic it used to grow, leveraging people like me in California to promote its stuff. Then, when the tide changed, it threw us all under the bus, and lobbied the state of California as well to knuckle under to the no-sales-tax proposals from Amazon and its ilk. Amazon: A great wonderful company that plays hard ball when needed. But not just why? But how? Similarly with Google. Is it a monopoly? Simon says, no – it’s a platform… But Google certainly acts like a monopoly – it has over 80% market share in search, sets the prices for AdWords through a mysterious ‘auction’ that is not at all transparent to the average AdWords user, claims not-to-be-evil, and then systematically squeezes competitors like Yelp by giving prime-of-place to its own Google Places listing. Therein lies the rub – monopoly or not, platform or not, ecosystem or not, Google has enormous market power (as does Apple, as does Facebook, and as does (to a much lesser extent), Amazon)… Does it matter if it’s a plane? A bird? Or a superman? At a societal level, it does matter! These companies are simultaneously great innovators and great monopolies – both creating, and stifling, innovation. Example: Apple, creating a whole new ecosystem of music and simultaneously destroying the old ecosystem – digital pennies in lieu of analog dollars, with huge social implications. Example: Amazon, creating a new way to shop for books, and simultaneously helping to destroy not just the neighborhood bookstore but any and all physical bookstores. At a business level, it matters, too! Example: Google making it possible for small businesses to reach customers efficiently through search, but simultaneously rigging the AdWords auction through ‘minimum bids’ to charge monopoly prices. Example: Facebook making it possible for businesses to connect to customers, but simultaneously setting new rules of the game that it alone defines. Here’s the confusion. Lots of companies want to be platforms, but only few succeed. Why? First and foremost: network effects. Companies like Facebook benefit from everyone using them, the more users who use them the more useful they become. Once they reach a ‘tipping point,’ or a ‘point of non-displacement,’ then they become very, very difficult to replace. So today’s Facebook may not be called a monopoly but because of network effects, it can (and does) act like a monopoly. Concepts such as ‘viral loops,’ ‘network effects,’ or ‘points of non-displacement’ would have made substantial additions to The Age of the Platform, yet where discussed, the discussion is fleeting at best. Second, understanding network effects and lock in would help us avoid the absurdity of thinking that Google isn’t a monopoly, or Facebook isn’t a monopoly. Just ask Yelp if Google is a monopoly! Once the point of non-displacement has been reached, expect Facebook or Google to act just like Microsoft. And so they do. Now, I am an intellectual – Berkeley Ph.D., Harvard B.A. – all that jazz – but debating what is a platform, and how these businesses work doesn’t really interest me. I am more interested in how I as a small business, or my clients, as small businesspeople can leverage platforms to grow their businesses. The practical impact of companies like Google, Amazon, Facebook, or Apple is much more interesting than esoteric debates about the latest novel concept attempting to become the business buzz book of the week. What is so intriguing about these four companies is that now that they so dominate their niches, you and I can attempt to work with them as ecosystem partners to grow our own business. They help us, and as long as we stay out of their way, we can hope to profitably leverage them. So, first, Google. Google as a monopolistic platform, gives us a two great ways to grow a business. One, SEO – manipulating Google’s relationship with our website to show up high on search results. Google’s brand means people go there, first, for search. And SEO gives us as small businesses an opportunity to be ‘found’ via Google, for free! How cool is that? And two, AdWords – the much inferior partner – paying Google to advertise, and thereby also be found. By leveraging Google’s platform we can grow our business. Second, Apple. One, the iTunes store helps artists and musicians be found, be discovered and grow their businesses. And two, Apps for the iphone also create a marketplace of ideas and app’s. Both of these – like SEO and AdWords – enable other busineses to help themselves as they help Apple expand it’s ‘lock in’ on a vibrant economy of music and applications for mobile. Third, Facebook. One, Facebook apps and two, Facebook pages for business – leveraging an already extant ecosystem of people on Facebook. Fourth, Amazon. One, let’s just look at books. Amazon creates an online bookstore, and through applications like Kindle gives authors a platform to reach those readers. The competition becomes (like SEO) how do you ‘get noticed’ on a very crowded platform, how do you get your book (or your website, or your app) to be noticed on Amazon? And there’s the rub. All of these companies have reached that point of non-displacement, that network effect that so benefits them yet it doesn’t directly benefit us. Over time, the terms of the relationship deteriorate (example: AdSense by Google, which was once a great program and now is virtual slavery for vendors), as the platform company grows ever more powerful, more monopolistic. Which brings us back full circle: as small businesspeople, these platforms are great FOR THEM but not so much for us. That discussion – the platform’s effects on the ecosystem – is completely missing from The Age of the Platform, sadly. What do platforms mean for society? Example: Amazon’s destruction of the ecosystem of physical stores and the related tax revenues from sales tax? And what do platforms and ecosystems mean for the ecosystem partners? Example: Amazon and its impact on the publishing industry, on the old ways of promoting books and the new ways of promoting books? That’s why this is a great book. Not for the answers it gives, but for the (implicit) questions it poses.